Judge Gill-Jefferson is a retired judge of the Civil District Court for the Parish of Orleans During her tenure on the court she served as Chief Judge. Subsequent to her service on the bench, Judge Gill-Jefferson served as a Visiting Professor of Civil Law at the Mississippi College School of Law. She remains a member of the Adjunct Faculty. Judge Gill-Jefferson has been appointed Special Master by the Civil District Court for the Parish of Orleans to make allocations of settlements of more than thirty million dollars. Currently, Judge Gill-Jefferson practices in the areas of Administrative Law, Domestic Relatons Law, Succession law. Insurance Defense, General and Commercial Litigation. 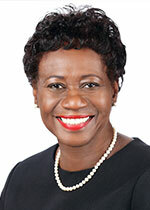 She also engages in mediation handling personal injury, contracts, and medical malpractice as well arbitration panels. She is a member of the Trial Advocacy Faulty at Tulane University.